What’s the word around town? If your patients aren’t talking about your practice, you might be doing something wrong. Reviews on your website might be nice, but they won’t reach potential patients. Together we can get your information updated on third party review sites, so that your patients will know where to share their thoughts. And, if you already have listings on third party sites, there’s even more you can do to improve your reach. Underneath these organic listings you will find review sites and several practices. No matter where the patient clicks, reviews drive high rankings in search results. When a patient begins looking at reviews, he or she has already figured out they need to visit the dentist. 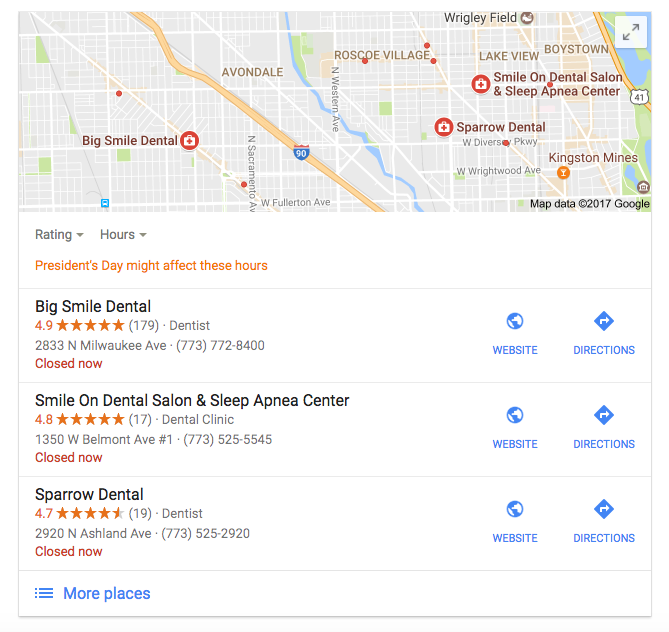 By researching practices and reviews, these potential patients are trying to find the best qualities in a dental professional. Reviews are also very important for referrals. When a person refers a friend or family member to your practice, they will immediately look at your reviews, too. It is important to note that the mental gap between reading a review and deciding to schedule an appointment is small—patients typically will decide instantly whether your office is a yes or a no. As a small office, your reputation can directly influence your bottom line. To maintain a positive image to patients and potential patients, you must continually work to ensure your online reputation is helpful. From maintaining social media accounts (yes, there are reviews there, too) to claiming and monitoring your business listing on Google, Yelp and other review sites, online reputation management is essential for referrals to your office. Positive reviews are great, but what do you do when a negative review is written about your practice? With a professional response, you can often turn a negative review into a good scenario. Respond on the site in a timely and polite manner with the goal of resolving their complaint. In doing so you are showing the patient, as well as potential patients, that you care about your patients and will work to correct any issue at hand. The combination of positive reviews, a high rating, and professional responses to any problems, they will feel more comfortable and confident in choosing your office for their needs. 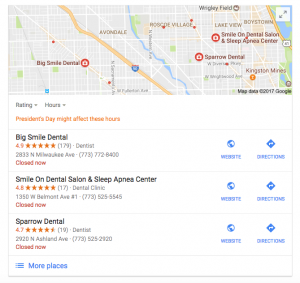 So, you already have your practice listed on Google, Yelp, and other review sites—now what? If you already have listings on those third-party sites that’s great! Let’s update those pages with photos! After all, you can never remain complacent with your information—always keep it updated and relevant. Post pictures of your office (inside and out) to provide patients with an idea of what to expect. If you’ve recently renovated your office, share pictures! And, if your patient calls with a raving review of their time in your office, encourage him or her to share their experience online so that other patients can get the same treatment experience. Keep services, contact information and links up-to-date, and always monitor your listings to ensure best practices are in place. If you need help managing your online reputation, utilize a team or a provider that can easily monitor and manage third-party review sites for your practice. And, if your current provider can’t provide online reputation management it’s time to find a new one—don’t worry, it’s easy. Create a goal for improved online management through the creation of listings or, if you already have listings, to update current information. Remember, your patients are looking and we want them talking!